Newsflash: VKB is listening, and after some back and forth with Ilya he agrees now to include that pinky switch that we all (including me) want for the MCG. Due to the design of the MCG, it might have to move up and to the side, but you will get that extra button on the grip! Also, the 2-way switch on the right side of the MCG head for your index finger will be redesigned as 4-way switch! Stay tuned for some updated renders soon (tm)! 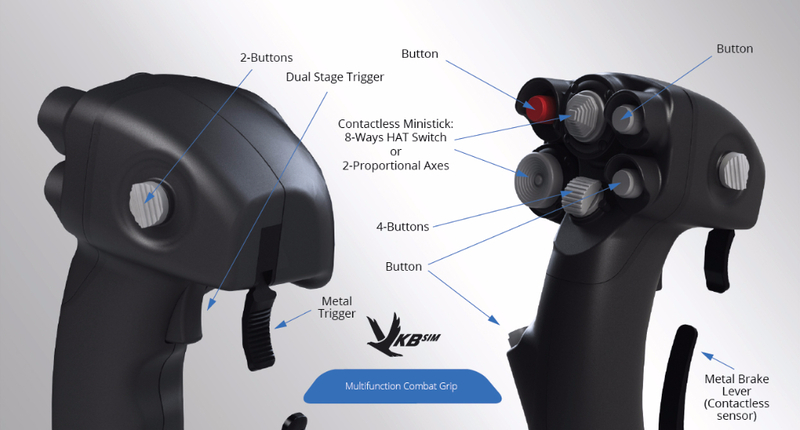 VKB is proud to announce the production launch of the VKB-Sim ‘Modern Combat Grip’ (MCG). This controller was developed by AVIAAVTOMATIKA in Russia for Sukhoi’s modernized ‘Flanker’ series of fighter jets, as well as their 5th generation prototypes. VKB engineers adapted the ergonomics of the real ‘Flanker’ grip for the use in flight simulations with only minimal design changes. This is awesome! Any news on the left-handed space sim grip? My feelings right now as above. When preorder may be starting? Propably have to get both, this and space sim later..
That external twist is interesting allso, some kinda extra piece that will be placed between base and stick? Last edited by Macross on Fri Mar 17, 2017 10:56, edited 2 times in total. - There are two ministicks, can we use both of them as proportional ministick as the same time or does one have to be a hat while the other can be a ministick? Due to Windows direct X limitation or something like that, I don't remember exctly. - The button called "4-buttons" is it really a hat? Cause the finger "print" on it make it look like a two side button. - And finally what is the secondary, metal trigger usually used for In Real Life? Like in the Ka-50? If so can it be folded up, and if so does the fold up position is recognised as a button, to activate safety? 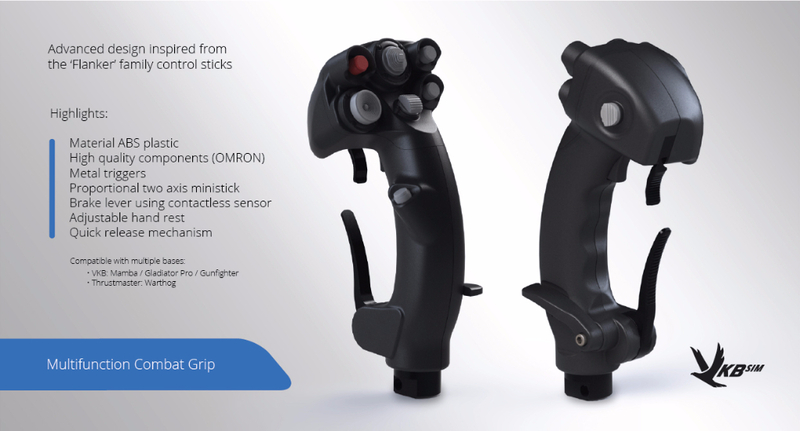 All in all congratulation for this Grip, it's 50€ less expensive than the Virpil one, and offer more feature long awaited like ministick AT THE CORRECT SPOT! (not like x56..). This is awesome news!! Will the twist adapter only work with the MCG? I am planing buying a warthog adapter and use the twist with my warthog grip. Will that work? That's a great news! Finally a proper grip for a space sims! I must say i like that break lever. As much as i need strafe forward/backward analog axis, doing it on off-hand (left hand for me that is) joystick is both somewhat uncomfortable and have some issues with "accuracy". That is i am using twist on my t.16000m right now for strafe(thrust) forward/backward in Elite. I can of course make it so Y-axis instead will be used for that (some twitch streamers actually do that), but then i still will need strafe(thrust) up/down as well, meaning i will have to use twist for that. More importantly i usually use strafe backward and strafe up/down at the same time in Elite, for most effective combat maneuvering. And even though that's doable, i have to say that twisting grip and pulling it down/up at the same time with left hand still quite uncomfortable, and not very accurate. (using all 3 axis at the same time with right hand joystick, Cobra M5 that is right now for me, doesn't occur any issues, nor in level of comfort, or accuracy). Would be most amazing of course having two break lever on both grips. But even one already might be very helpful. At least in Elite i actualy use only strafe backward, and never strafe forward. Thus single lever might be more than enough for me in that game. neok23 wrote: This is awesome news!! Will the twist adapter only work with the MCG? I am planing buying a warthog adapter and use the twist with my warthog grip. Will that work? Good question. Let me find out. But I assume that this twist adapter is geared only for the MCG. I will ask VKB HQ to get you the correct answers on these! Stay tuned! hon0 wrote: All in all congratulation for this Grip, it's 50€ less expensive than the Virpil one, and offer more feature long awaited like ministick AT THE CORRECT SPOT! (not like x56..). Thank you! I believe that VKB has really landed an awesome grip here that everyone will love! Goloith wrote: This is awesome! Any news on the left-handed space sim grip? It's in development, and we will get some news out after the Gunfighters ship. Macross wrote: My feelings right now as above. Preordering tentatively slated for April 30, 2017. The external twist adapter will indeed go between the controller's base and the grip. More details later when I get more news from VKB HQ. Huh, good question indeed. Would it be possible to have warthogs with twist?